Jevity 1.2 Cal is a high-protein,fiber-fortified tube-feeding formula for supplemental or sole-source nutrition for adults who are on short or long-term tube-feeding regimens. It is high in protein (18.5% of Cal) which helps patients gain and maintain healthy weight. 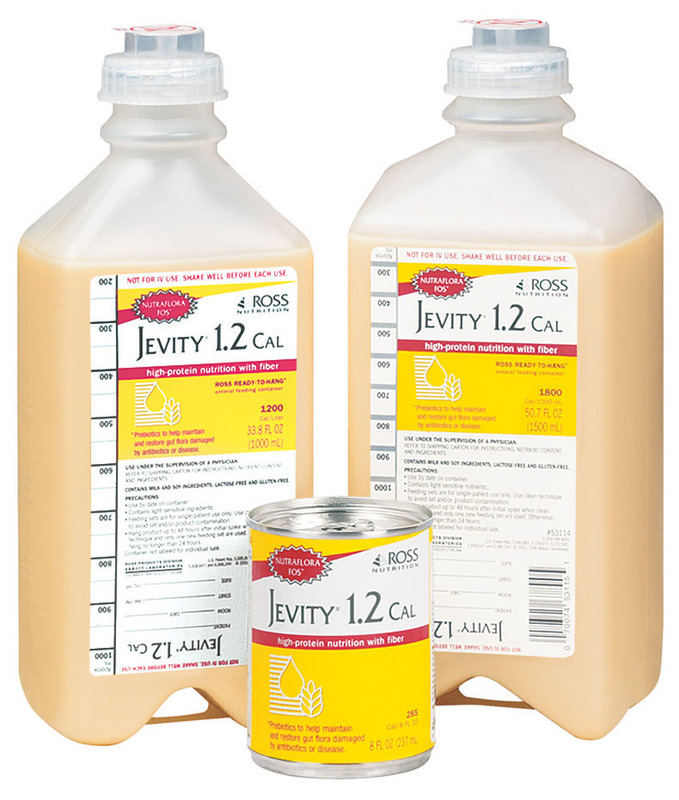 Jevity 1.2 may be used for oral feeding of those with altered taste perception. It is not for IV use or for people with galactosemia. Jeviy 1.2 Nutrition has 18g of total dietary fiber/L (10g of a unique soluble and insoluble fiber blend and 8g of NutraFlora scFOS). It meets or exceeds 100% of RDI for 24 essential vitamins and minerals in 1200 Cal (1 Liter). Halal, Kosher, and Gluten-free. Suitable for lactose intolerance. :: Ingredients: Water, Corn Maltodextrin, Corn Syrup Solids, Sodium & Calcium Caseinates, Soy Protein Isolate, Canola Oil, Corn Oil, Fructooligosaccharides, Medium-Chain Triglycerides, Soy Fiber, Oat Fiber, Calcium Phosphate, Magnesium Phosphate, Potassium Citrate, Gum Arabic, Soy Lecithin, Potassium Chloride, Carboxymethylcellulose, Sodium Chloride, Ascorbic Acid, Choline Chloride, Sodium Citrate, L-Carnitine, Taurine, Zinc Sulfate, dl-Alpha-Tocopheryl Acetate, Ferrous Sulfate, Niacinamide, Calcium Pantothenate, Manganese Sulfate, Cupric Sulfate, Thiamine Chloride Hydrochloride, Pyridoxine Hydrochloride, Riboflavin, Beta-Carotene, Vitamin A Palmitate, Folic Acid, Biotin, Chromium Chloride, Sodium Molybdate, Potassium Iodide, Sodium Selenate, Phylloquinone, Cyanocobalamin, and Vitamin D3.Contains milk and soy ingredients.